Projecting Lowertown. Photo courtesy Lucas Koski & James Ramsay. 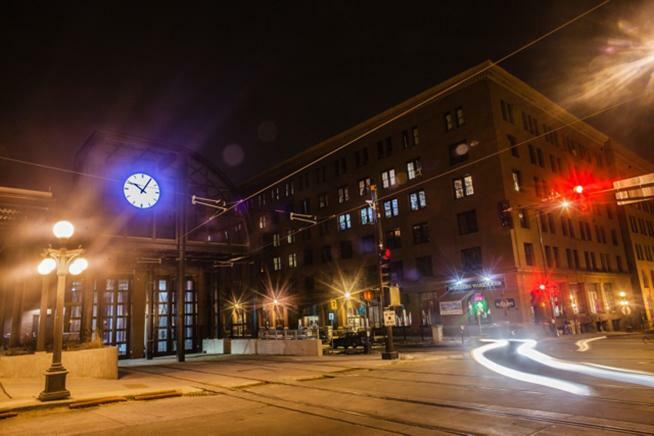 Projecting Lowertown will be a composite of images featuring Lowertown, St. Paul at night; including portraits of artists from the neighborhood, images of the brick facades of the historic district as they change overnight, and will feature some movement from dancers and performers. The piece will be projected on the Cowles Center for Dance and the Performing Arts’ modern facade, highlighting the juxtaposition of the Lowertown historic arts neighborhood and the modern facade of the renovated dance facility. This project aims to connect two disconnected neighborhoods in a meaningful way, that will very soon be connected by the ambitious Green Line of Metro Transit, which officially opens the day of the Northern Spark event! Resident Intern on the project is Kenal Lewis, from Harvester Artspace Lofts.